We quest for the odd and unusual vintage guitar. This singular example is one of the more peculiar we've owned. 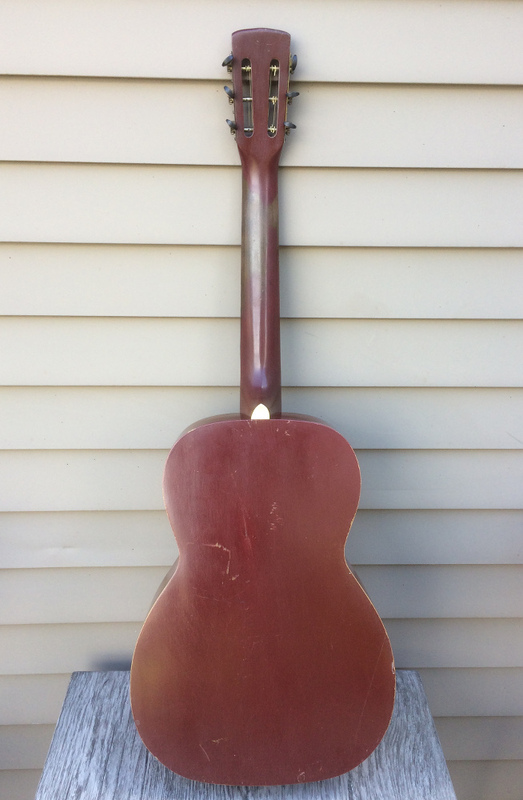 At first blush, it appears to be a 12-fret slot-head catalog guitar made in the thirties in one of the large Chicago factories. Upon closer inspection, a few details emerge that make you go 'hmmmm'. First, the body ..top, back, sides.. is solid birch, not unusual for a catalog guitar, but, this one is X-braced, right from the factory. We've never seen an X-braced, birch-topped guitar before. Second, the rich blood-burgundy paint is distinct when compared to its peers from the depression era; plus, the top is adorned with an art nouveau styled floral decalcomania ... and that shade of green in the sound hole rosette! Last, the lining strips that connect the top/back/sides are solid strips, not kerfed as one would expect. I've seen solid lining on some Gibsons in the thirties, but this guitar is not a Gibson. The bridge is likely maple, painted black, with a straight saddle. The bound fingerboard appears to be dyed maple. The neck is poplar (although if felt like rock maple when trimming the heel during the reset), and is carved in a flattish 'C' rather than the typical pronounced 'V'. The lower bout measures 13 1/2" across, and the scale length is 25", a nice short scale. The fingerboard measures 1 13/16" across at the nut and string spacing is 2 1/2" across at the saddle, nice fingerpicking dimensions. The guitar is 100% original it seems, including saddle, nut, tuners and bridge pins. Judging the playing wear, one could conclude that this was a one owner guitar. The only evidence of prior repair is a glued lateral top brace across the upper bout. We recently reset the neck in our shop. There is a bit of chip out between pin holes in the thin, maple bridge plate. The brass tuners show some patina, and there are some nicks and scratches in the paint from wear, but nothing to write home about. Just an overall clean and visually appealing guitar .. oh, and it plays great, too. The action is set at about 6/64", and the neck has that wonderful tactile feel from decades of playing. So what does a birch bodied, X-braced concert guitar sound like? Kind of difficult to describe...but it certainly has a bit more ring and sustain when compared to its ladder-braced brethren. The tone is nice and even across the strings, with more projection than woody warmth you'd hear in a spruce/mahogany combination. An oddball for sure, but it's successful on all levels: condition, playability, sound and uniqueness.